NAD+ (nicotinamide adenine dinucleotide) is a coenzyme found in all living cells which means none of us can live without it. NAD+ helps turn nutrients into energy for our metabolism and it helps molecule proteins regulate other biological activities. These processes are extremely important in regulating oxidative stress and circadian rhythms while maintaining the health of our DNA, thus keeping us healthy as we age. The only problem is, that as we age, our NAD+ levels decline over the years. From metabolism to DNA repair, NAD+ is constantly working hard in the cells of not only humans, but other mammals, bacteria, and even plants. NAD+ was first discovered in 1906 by two scientists by the name of Sir Arthur Harden and William John Young. They were trying to figure out how yeast can metabolize sugar and create alcohol and CO2. After close to 20 years of research, the two were able to identify NAD+ and they shared a Nobel Prize in Chemistry in 1929 along with fellow scientist Hans Von Euler-Chelpin for their work on fermentation. They discovered that NAD+ plays a critical role in the fermentation process, which a metabolic process in itself, thus leading them to discover the critical role of NAD+ in all metabolic processes in humans. Since their discover, NAD+ has been researched and analyzed because of it’s importance in our health and vitality. In 1931, Conrad A. Elvehjem and C.K. Koehn identified nicotinic acid as a precursor to NAD+ which led to mitigating an outbreak of pellagra in the American South. In the 1900’s, Pellagra was plaguing the people in the American South. Pellagra is a curable dietary illness that if left untreated, leads to dementia, diarrhea, dermatitis and death due to lack of the precursors for NAD+. Scientists were able to discover that a lack of NAD+ was causing this horrible plague. The fatal disease was connected to something missing in their diet. They were able to provide people effected by the plague with milk and yeast to alleviate their systems. Both milk and yeast have NAD+ precursors. NAD+ precursors include; nicotinic acid, nicotinamide, nicotinamide riboside, and NAD+ itself. These nutrients are metabolized in the gut, then synthesized again in the cells. Fast forward an entire decade and a scientist by the name of Arthur Kornberg discovered NAD synthetase, the enzyme that makes NAD+. His research was a breakthrough in understanding the essential building blocks of NAD+. Later that decade, Jack Preiss and Phillip Handler took the research further and discovered what is now know as the Preiss-Handler pathway. 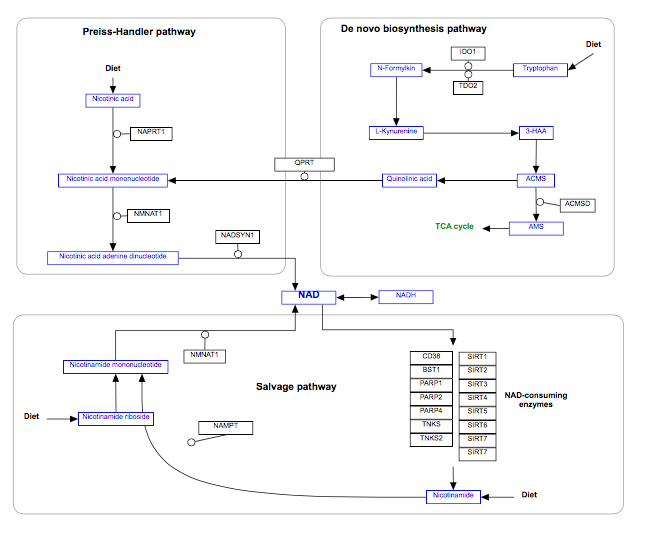 This pathway shows how the precursors become NAD+. For example, in the case of the pellagra cure, the pathway showed how nictonic acid (B3 found in the milk and yeast) became NAD+. This is a great research article that goes in depth on B3 and NAD+ for treatments of many illnesses. Fast forward to our time, NAD+ has become a prized molecule in scientific research because of it’s central role in biological functions. A study in 2016 found that mice and worms with degenerative muscles had improved muscle function when supplemented with NAD+ precursors. Another study in 2017 discovered that mice who were given NAD+ had DNA damage repair and yet another study in 2018 fund that mice who were supplemented with NAD+ precursors had improved cognitive function. 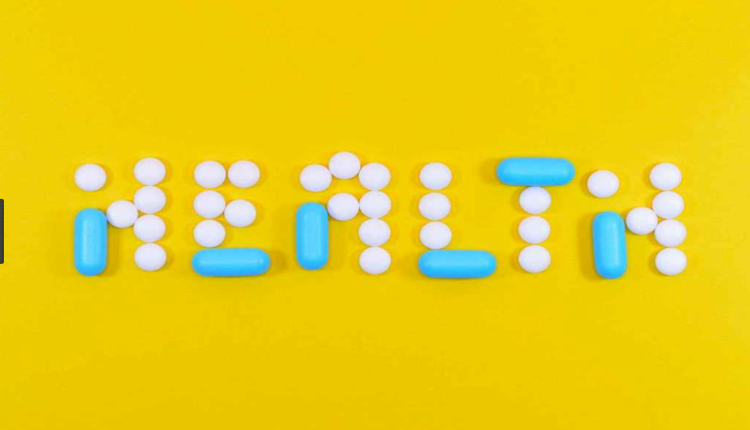 Seeing that NAD+ health has such a positive role in mice, scientists have been working hard to translate this research for the human body because as we age, our NAD+ decreases. 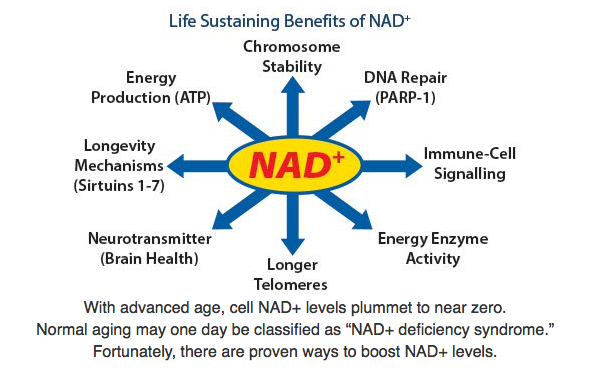 Over the years the research has shifted from discovering what NAD+ is, to discovering how supplementing precursors of NAD+ can help slow the decline of certain coenzymes vital to aging, metabolism and more. Studies show that by the age of 50 a typical person may have only half the NAD+ they did in youth and by the age of 80, NAD+ levels drop to only 1% to 10%. Scientists in our day and age are studying several anti-aging mechanisms that NAD+ contributes to. For example, NAD+ is required for the proper function of sirtuin proteins. Sirtuin proteins contribute to longevity, in specifically in maintaining the length of critical telomeres. In short, telomeres are stretches of DNA strands that cap the ends of chromosomes. Over time as cells replicate themselves, the telomeres become shorter and shorter until cell renewal stops. This leads to accelerated aging and death of the cell. An increase in sirtuin proteins could possible create a longer life for the telomeres but sirtuin proteins need an ample level of NAD+ to function properly. Thus, extending the life of the telomeres with NAD+ shows hope for the aging process. Another way that NAD+ helps with anti-aging is by promoting DNA repair. Broken DNA strands lead to mutations in crucial genes and an increase in DNA damage speeds up the aging process. Our body naturally tries to repaid damaged DNA with an enzyme called PARP-1. However, in order to even carry out the repair functions, it needs a large amount of NAD+. Increasing NAD+ can give PARP-1 the strength it needs to repaid damaged DNA. One more way that NAD+ aid in anti-aging is by the modulation of Immune-Cell Signaling. Diseases such as autoimmune is caused when cells begin to lose their focus. This happens for a variety of reasons, including age. Proper levels of NAD+ regulate the immune system and inflammatory pathways. So you can see why NAD+ is crucial in cellular energy which protects against infections and autoimmune disease. These are just three ways that NAD+ works in the body to promote anti-aging. There are many others and you can read more in depth in this article here. You can start taking supplements that containing nicotinamid riboside (NR). This has been discovered as a form of B3, which is found in milk. This was used to increase NAD+ levels in the early 1900’s, as mentioned previously, when the people of the American South were plagued with pellagra. Calorie restriction (20-30% less than what you normally eat) along with fasting has also been shown to increase NAD+ levels by activating SIRT1. SIRT1 and 3 improve oxidative metabolism. Some studies suggest that Intermittent Fasting and Keto Diets are a great way to increase NAD+ levels. As you can see throughout history, NAD+ research continues to prove how important this molecule is for our health and vitality. Scientists are still constantly discovering new ways to increase NAD+ and how this attributes to a holistic approach in the anti-aging process. We will continue to see more discoveries on NAD+ in the future and how it can improve our quality of life.